Reprint. Originally published: London: Earthscan, 2009. 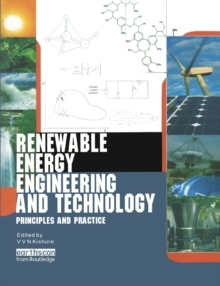 This is the most comprehensive guide ever written on renewables technology and engineering, intended to cater for the rapidly growing numbers of present and future engineers who are keen to lead the revolution. All the main sectors are covered - photovoltaics, solar thermal, wind, bioenergy, hydro, wave/tidal, geothermal - progressing from the fundamental physical principles, through resource assessment and site evaluation to in-depth examination of the characteristics and employment of the various technologies. The authors are all experienced practitioners, and as such recognise the cross-cutting importance of system sizing and integration. Clear diagrams, photos, tables and equations make this in invaluable reference tool, while worked examples mean the explanations are well-grounded and easy to follow - essential for students and professionals alike.